In many respects Stunt Squad is very similar in tone and theme to Colt 38 Special Squad from the previous year. 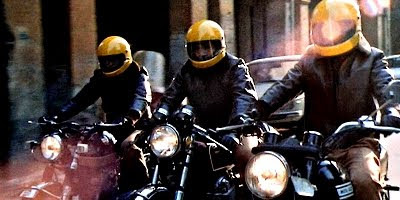 Marcel Bozzuffi, yet again, leads a special squad of motorcycling coppers who operate as law enforcement outriders stretching the definition of legality in the name of law and order as bombing is again used as a terror tactic and the casting of Riccardo Salvino, among others, further emphasises the connection with Massimo Dallamano's sublime Eurocrime masterpiece. A lowlife pimp played by genre face Nello Pazzafini takes some hefty beatings, Tito LeDuc plays, with a certain flamboyance and a Quentin Crisp-esque wardrobe, to the obligatory gay stereotype but it is the cold hearted human booby trap dispenser of a villain played by Vittorio Mezzogiorno who is the real icing on the cake in this high octane sensorial onslaught of bikes, fists and bloody shootouts. Serious points regarding the poitical climate and mood of the times are made when, despite operating on the edge of the law, the police are shown as impotent while it is a lynchmob who surge on the weakened Mezzogiorno, beat him down and leave him prone and defeated in a bloody mess of a crucifixion pose. Seriously exciting, and exhilirating from the cruel tone setting get-go, Stunt Squad is a film that has to be, as a text book example of genre themes, high on the list of titles worthy of exploration for any Eurocrime neophyte.